Mirror with scalloped metal frame. The glamour is all in the geometric, mirrored tile insets framed by a silvery and gold-leaf finished border on this handcrafted mirror Mirror with cast-metal frame. Dual hangers; hangs vertically or horizontally. Beveled mirror with gold leaf finish on frame. Wood composite frame. Hangs vertically or horizontally. A gilt frame connecting four irregular, rounded surrealist shapes each with an inset modern mirror. The frame will hang in either portrait or landscape orientation. Mirror has Chilean pine frame. Handcrafted mirror. Steel frame. Hangs vertically or horizontally. Mirrored glass, MDF Finished in gold, the steel concave outer frame surrounds a modern bevel edged mirror which is also set into a simple square gold frame. Polyurethane frame. Gold-leaf accents. Beveled mirror. This contemporary design, forged in delicate iron, lends itself to creative displays, boasting a rich, metallic silver leaf finish. Clover shaped mirror with wood border. The Lianna Mirror's unique shape is a statement in itself but combined with a hammered gold-finished iron frame and black chiseled marble crown it becomes a true focal point for any room. Brushed brass iron, engineered hardwood Four small beveled mirror panels are intersected by solid white trim. At the heart of the piece is a perfectly circular beveled mirror. Mirror/wood composite/eucalyptus. Handcrafted clear glass mirror with beveled edge. 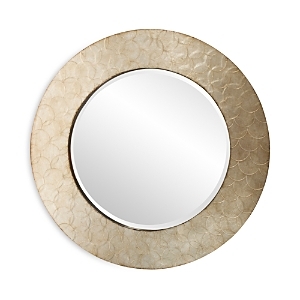 Modern mirror frame with scalloped corners in gold finish. Handcrafted mirror consisting of three cockbead frames of diminishing size, the two outer framed have inset panels of antiqued mirror while the center pane is a single piece of beveled modern mirror. Wood frame is finished in gold. Handcrafted, honeycomb pattern of mirror panes, the larger shapes of mirror have a 1" bevel while the smaller rectangles are plain. Wood frame itself is finished in gold. Handcrafted rectangular glass mirror. Frame stitched with diagonal pieces of natural hair on hide (India). A simple clean modern mirror on a silver leaf edged mount. A set of eight cast brass and textured brackets complete this simple but sophisticated design. 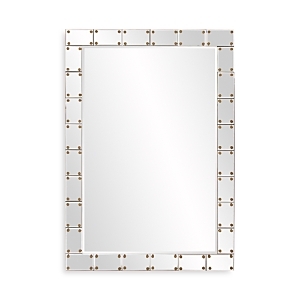 Beveled mirror with mirrored border and golden beading detail. 36"W x 3.5"D x 48"T. Hangs vertically or horizontally. Handcrafted beveled mirror. Wood composite frame hand-painted with gold leaf finish. Can be hung vertically or horizontally. Handcrafted beveled mirror with iron burned out frame. High quality electro plating finish with brass lacquer coating. Handcrafted mirror. 36"W x 2"D x 48"T. Mirror inset in a reproduction of an original giclée from Mary Hong adorned with pieces of tempered glass for a decorative surround. Wood frame. Made in the USA. A boldly sized frame in a fabulous black-and-white spotted hide turns this floor mirror into a dramatic and on-trend statement. Galactic mirror is a unique design where wall art is converted into a mirror. The canvas surrounding the beveled mirror is enhanced with tempered glass fragments and golden leaf, then encased in a clear epoxy resin to protect and give the frame a polished look. Mirror-framed mirror. Wood composite backing. Antiqued mirror trim. Golden finish. Anti-tipping kit included. This mirror is truly an example of "reflective art". This beveled mirror has a beautiful display of broken glass artfully placed onto a giclée finished with the high gloss finish. This partial reproduction of a Mary Hong piece is sprinkled with gold leaf which sparkles with life and art! 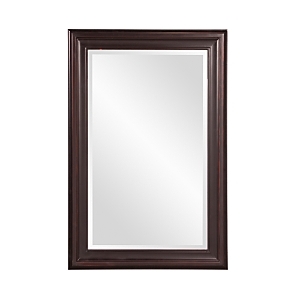 Mirror with classic rectangular wood frame in an antiqued finish. This natural toned textile giclée of Carol Benson Cobb's "Dune" enhances the inset beveled mirror and chrome finished frame. Brass, glass The looking glass has long romanticized round shapes. Finished in goldleaf, this geometric rendition adds a few angles to the mix. Grandly sized mirror encased in frames within frames makes an impressive statement Award-winning designer Bethan Gray's love of detail, texture, and luxury defines her signature style. Hailing from an ancient Rajasthani clan - a nomadic group that migrated across Arabia and Persia before settling in the Celtic heartland of Wales - Gray draws on the craft traditions of both East and West, paying homage to her own heritage and creating truly original works of art. In our collaboration with the Welsh designer, she embraces both sleekly geometric and fascinatingly biomorphic silhouettes and endows them with an eclectic, yet modern touch - the result is a glamorous, head-turning collection that's well worth indulging in Handcrafted beveled leaner mirror. Fir wood frame. About the height of most supermodels—the glamorous, attention-getting Ilsa leaning mirror. 35"W x 1.5"D x 70"T. Gleaming hand-gilded gold-leafed pyramids of handcrafted wood and resin frame a dramatic-length leaning mirror. Sold as set of two; we show two sets. Beveled-edge mirrors are bordered by antiqued, mirrored insets. Beaded-edge frames of wood composite and resin are hand finished in antiqued gold leaf with a dark gray wash. Beveled mirror. Hand-decorated and hand-painted wood/wood composite frame by master artisans. Gold-leaf inner molding. Flat bronze studs Rectangle, beveled mirror with acrylic knobs. Can be hung vertically and horizontally. 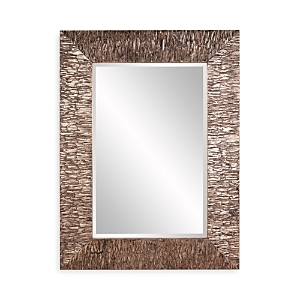 Beveled mirror is embellished with a beaded frame in an antiqued silver finish. Can hang vertically or horizontally. Shiny rectangles frame a simple looking glass, creating a classically styled mirror. Rectangle wall mirror with nickel finish metal frame. Can be hung vertically or horizontally. 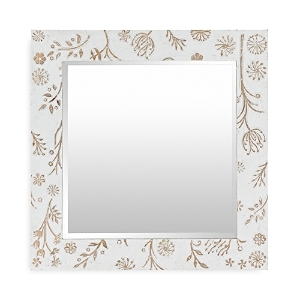 Silver Handcrafted mirror with decorative beveled cut pattern with brass clips. Frame is made of solid pine with gold leaf finish. With its thick blackened iron frame this 82" rectangular mirror commands attention. Ideal for leaning against the wall or hanging with the security cleat attachment. The size is perfect for vertical or horizontal hanging. Handcrafted mirror with crystal trim. 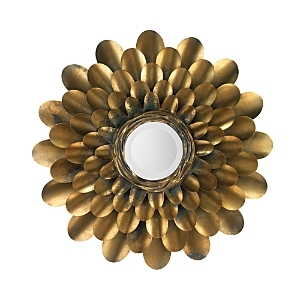 Mirror's cast resin frame has a distressed gold-leaf finish. Handcrafted mirror with octagon-shaped mirror border. Beveled mirror set in a metal frame embellished with softly sewn wood beads finished in indigo. 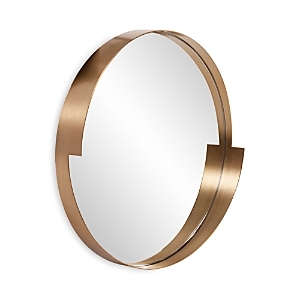 Mirror includes metal hangers for mounting both vertical and horizontally. Wood beads/glass mirror. Beveled mirror in mirrored frame. 33"W x 0.6"D x 44.5"T.
Finished in a metallic champagne silver with bark texture accentuated in a black wash Hand-carved botanical design. White-washed finish Simple and classic, this rectangular frame from Howard Elliott has a timeless, versatile look to fit a variety of interiors. Glass and Iron. Unique item—perfect for any style. Featuring glass panes back-painted in early morning inspired shades and a generous brass frame, our Harlequin Round Mirror is the ultimate expression of Modern American Glamour. Colorful yet quiet, edgy yet soft, minimalist form with maximalist presence—this mirror hits all the right notes. Fabulously futuristic in your foyer or perfectly pretty in your powder room. Handcrafted mirror. Overall, 44"Dia. x 1.5"D. Solid ash frame with ribbed design. Inset mirrored glass with beveled edge. Beveled mirror, 11.75"Dia., in acrylic and goldtone frame. 51.25"Dia. x 1"D overall. Round mirror features linen covered and studded frame. 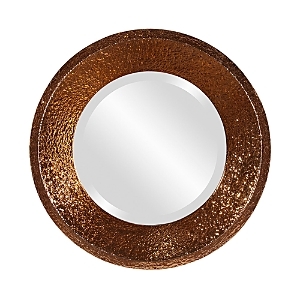 Round mirror with metal border. Mirror bordered with triangle glass pieces Round mirror with layered wood frame.